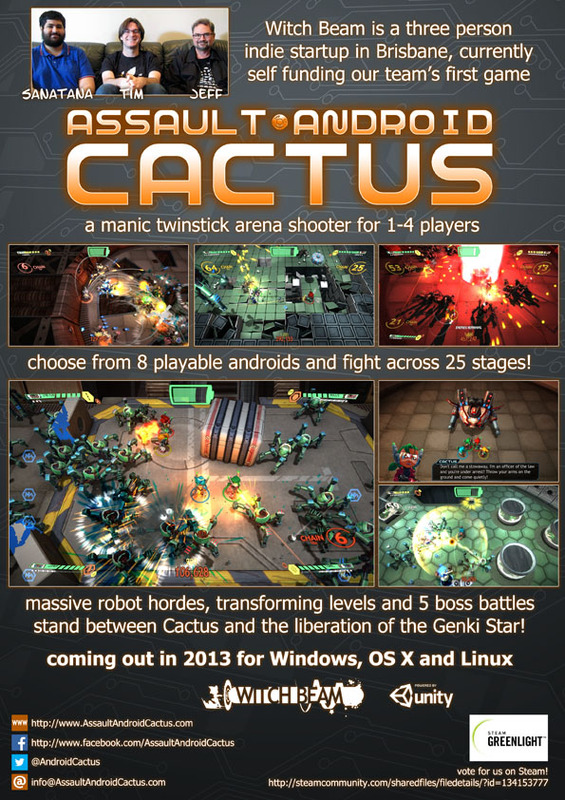 Assault Android Cactus: Convention time! Cactus has been on the road and in the sky! Over the last two weeks we've shown the game at both AVcon in Adelaide and PAX Aus in Melbourne! It's been super exciting for us and great to meet people and get them hands on with the game. First up was the Indie Games Room at AVcon. 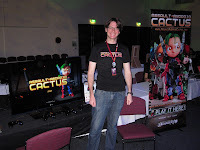 I was born and grew up in Adelaide and been making the trip back for AVcon every year since I moved away so for me it was a pretty big deal to be there showing off Assault Android Cactus to the public for the first time. This isn't something I've done before and was running the table alone and had no idea what to expect. I designed art for a two meter retractable banner and had it printed up, had new business cards made, designed a flyer and a "how to play" reference sheet. I had to rent a television and ran the game off my laptop, which meant everything but the TV came down with me on the plane. I was staggering around with a backpack, laptop satchel, wheely luggage and a banner holstered over my shoulder. After a slight scheduling mixup on Friday (the setup day) that involved me sprinting full pelt down North Terrace before the courier left, I stood in line for hours getting the electrical items safety tagged before finally getting everything set up ready for Saturday morning! 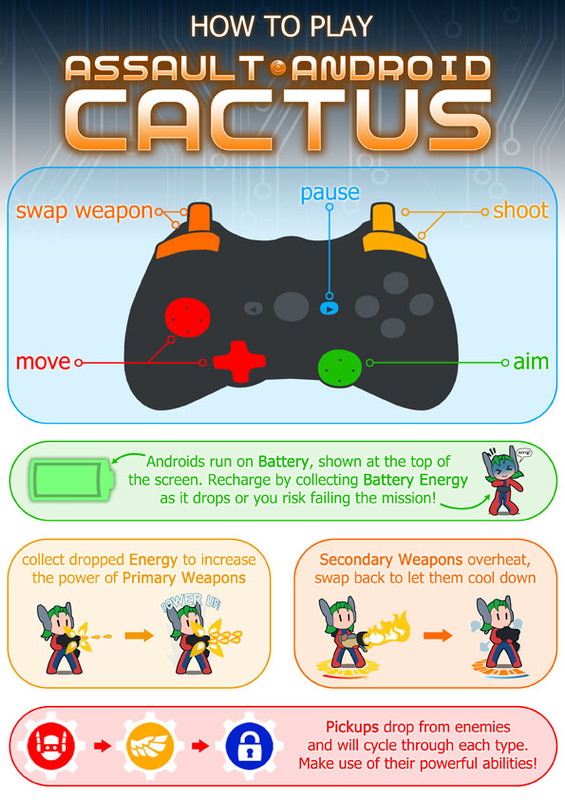 A quick test of Cactus revealed that characters were switching inputs between levels! Oh, a catastrophic bug that had never been seen before! Great! A minor freakout and a hasty debugging session that night revealed the fault was with the USB hub I'd bought that day and a reshuffling of the ports seemed to resolve it, and I was back on track! The convention itself was exhausting but hugely rewarding. I met so many people and got them hands on with the game, and the room itself had a great vibe and everyone seemed really interested in what we've made. Check out Games.on.net coverage of the show. more photos from PAX available here! The weekend afterwards was PAX Aus! Sadly we were not selected for the Australian Indie Showcase and we missed our chance to be part of the Indie Pavilion, but at the last minute, Sanatana was able to arrange something with the guys at Frag Labs to have Cactus running at their booth! Holy moly, we're going to be at Australia's first PAX! So many people came through and we got an amazing reaction. Thankyou to everyone who took the time to come and play it. We handed out all the flyers I printed up for PAX as well as the left overs from AVcon and on Friday were handing out our business cards just so people had a URL to look up. Games.on.net were there, IGN AU included us in their list of devs to watch and Ben Kuchera from the Penny Arcade Report dropped by to check out the game and seemed to like what he saw! So we're safely back in Brisbane now recovering and responding to enquiries and followups as they come in. Twitter has been buzzing and it was just an amazing opportunity. If you came by and played it, thankyou, and please tell your friends and if you want to let us know what you thought leave a comment here, or on the Greenlight page or over on our Facebook page. We'd love to hear from you and are happy to answer questions!